In summer, perfectly ripe tomatoes, fresh corn kernels, fragrant torn basil and fresh mozzarella mingled with small kernels of grain is a winning combination that goes with nearly everything on a summer table. The combination is good with penne pasta, but healthier and more flavorful with a whole grain, such as farro, spelt, wheat berries etc. If you have herbs from the garden – anything from mint, oregano, chives, dill – add a few tablespoons. Bring a large pot of salted water to a boil and add the grain. Cook according to the directions. For farro, cook grain for 25-30 minutes; for wheatberries, cook for 1 hour, 20 minutes. About 3 minutes before grain finishes cooking, add the corn kernels. Drain the corn and grain. Shake the strainer several times to stop the cooking and release any steam. Let cool. 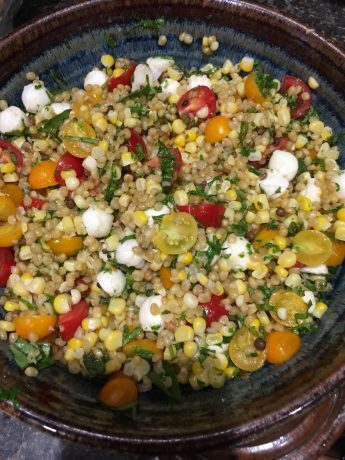 In a large serving bowl, toss the grain and corn with fresh mozzarella, tomatoes and lemon zest. To make the dressing, in a small bowl, whisk together all of the dressing ingredients. Just before serving, dress the salad, then slice or tear the basil leaves into thin strips and gently stir them in.